This is a free release from Solar Records showcasing the best of Kryptik‘s journey into producing, a gift from him to you. Rewire is named for the concept of when one first experiences the realm of the psychedelic land of a doof: it has the effect of a soul being rewired into the earthly powers, leaving the dancer to see the world and everything in it with a new perspective. 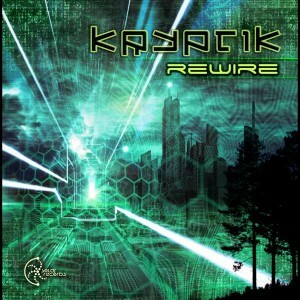 Kryptik’s driving progressive psytrance sound will bring you in and out of the psychedelic realm. With its rhythmic journey set at the heartbeat of the amazing Hawkesbury River, deep in the Australian bush, this is a pure representation of the movement of life within ourselves. Mastered by Felix Greenless AKA Terrafractal @ Fractal Sound with artwork by Clint Grierson. MP3 Download | FLAC Download | WAV Download · Download count: 4,997. Tasty morsels of sound to stimulate the awareness and tantalize the senses. Generous Australian feel, gum trees, kookaburra morning and a dash of tidal creek. Its amazing what youre doing there down under … thank you all for these magical music moments…. i will collect money to travel to australia in a few years.. which festival would you prefer??? Like to listen to Kryptik, Disect and so on…. High guys, the Song rewire is really awesome, but we were thinking about the piano solo at 7:30. Do anyone of you know where this is from?